One of the most interesting and enduring of all puzzle types is the sliding block puzzle. These make excellent challenges for computer games that require puzzles or have little 'tasks' to do throughout the game. The interactive element of wii, playstation and indeed using a stylus on handheld systems like the Nintendo DS are ideal platforms for sliding block puzzles. However they could of course also be used in their original context as physical puzzles, and equally well online implemented in a Flash game or similar. There is an infinite variety of these puzzles, and they all have the same simple aim, but it is usually quite tricky to achieve: to manipulate and re-arrange the pieces in the start grid to reach a desired outcome. Typically this will be to get a designated block from its starting position to a specified end state, making moves that are valid in the game. In sliding block puzzles, pieces may move up, down, left or right, but pieces cannot go through walls, any other boundaries or of course through other pieces. These restrictions and a carefully designed puzzle can make a sliding block puzzle that is beguiling, frustrating but also highly addictive as players try to overcome the challenge presented. Sometimes with a hard sliding block puzzle it may look initially as though it is not possible to reach the solution state, as the grid often starts with very few possible moves, and generally the grid will have few empty squares. However even in these highly constrained states sliding block puzzles actually have a surprisingly huge number of possible grid configurations, which means that persistence is often required to solve them. 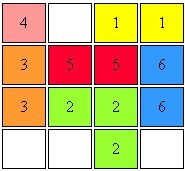 If you'd like to try a medium puzzle, then look at the grid displayed on this page. Try to see what the minimum number of moves is that it takes you to get the yellow '1' block from its start position at the top right to the bottom left of the grid. A move is simply defined as any piece moving up, down, left or right by one square. To do this you'll need to copy out the grid / pieces as it is impossible to do in your head! Whether you are looking for a simple sliding block puzzle for children or a very hard one for a grown-up audience, we can create a puzzle to fit the bill. We can also even create interactive sliding block puzzles for use on websites / online in general. Puzzles can be designed with pieces in a range of sizes and shapes; generally in order to make an interesting puzzle the grid will be quite small in dimensions but appear highly constrained. Please do contact us if you are interested in having a sliding block puzzle designed for you.